Carlyle Dental offers dental crowns for residents living in Kinston, Goldsboro, Greenville and the surrounding areas of North Carolina. A dental crown is a tooth-shaped covering that is bonded over the natural tooth, which restores its natural shape and size and improves its appearance. Crowns are highly effective in repairing badly decayed or damaged teeth, and can eliminate pain from previously injured teeth. They strengthen and protect teeth that have undergone root canal therapy, and can even provide support for a large filling that has very little tooth structure remaining. Dental crowns are a long-lasting and effective way to improve the look and functionality of your natural teeth, while also enhancing your smile. Metal crowns are strong and durable, and are preferred for back teeth, where they provide extra support for biting and chewing. Ceramic crowns are a natural-looking choice for front teeth, as they are made of a translucent material that closely matches the natural enamel. Porcelain-fused-to-metal crowns are fabricated using different dental alloys, and because they are fused to metal, they are stronger than ceramic crowns. They are the best treatment option for anchoring dental bridges, as well as for dental implant restorations. If you have a broken or fractured tooth, large fillings without sufficient tooth structure, or discolored or misaligned teeth that cannot be repaired with a veneer, dental crowns in Kinston, NC and Greenville, NC might be your best treatment option. An initial consultation will be carried out, and if the decision is made to apply crowns, Dr. Carlyle will begin preparation of your teeth. Old fillings are removed along with any decay, and a foundation material applied. 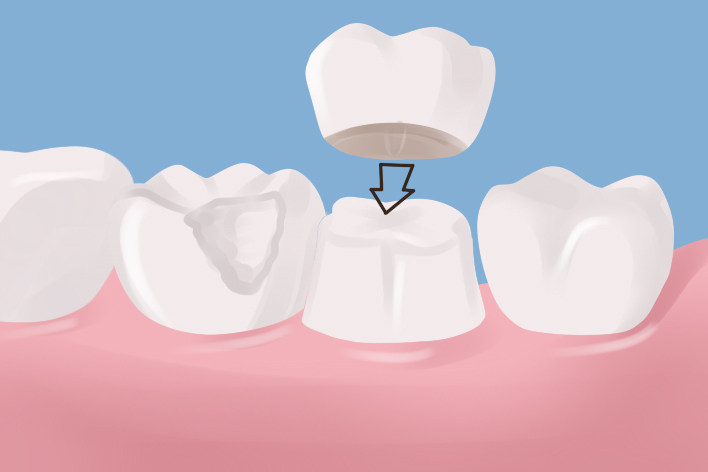 Impressions are made of the tooth, and the surface is prepared for the crown to be bonded. The crown’s color will be selected to match your natural tooth shade, and a temporary crown will be fitted. On the second visit, the temporary crown is removed, and the permanent crown is securely bonded to the surface. Although you may experience some tenderness or sensitivity in the gum area, most patients do not require any anesthesia, and will be able to bite and chew normally immediately after cementation. Carlyle Dental offers residents of Kinston, NC and Greenville, NC the option of dental crowns in a single visit, which is a very attractive choice for patients who suffer from dental phobia, and who may feel apprehensive about visiting the dentist, as a result. How Much Do Dental Crowns Cost in Kinston, NC? The cost for dental crowns varies and depends on the extent of treatment necessary. We accept cash, MasterCard, Visa, and personal checks. Insurance is accepted, and we also have financing available through CareCredit® and Compassionate Healthcare Services®.